GET QUOTES FROM TOP PROVIDERS • 100% FREE! To Compare funeral plans can be difficult if you do not know what to look for. Luckily, we have made it as easy as possible to compare funeral plans in South Africa. We list some of the things you need to look out for. Feel free to read up as much as you can about each potential provider. Firstly, what does the policy cost? This is one reason why you should compare funeral plans. You need to know if a policy is affordable or not. Every quote is unique to the client. It depends on the amount of people, relationships and cover amounts. The older a person, the more it will cost. Make sure you can afford the policy. You can drop or raise cover amounts until you are comfortable with the monthly premium. Remember, you do not pay anything extra to get a quote, or sign up with our service. Secondly, what are the policy benefits? Does the provider offer cash only, or do they have added benefits. 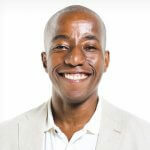 This is important to know as it affects the true value of the policy. 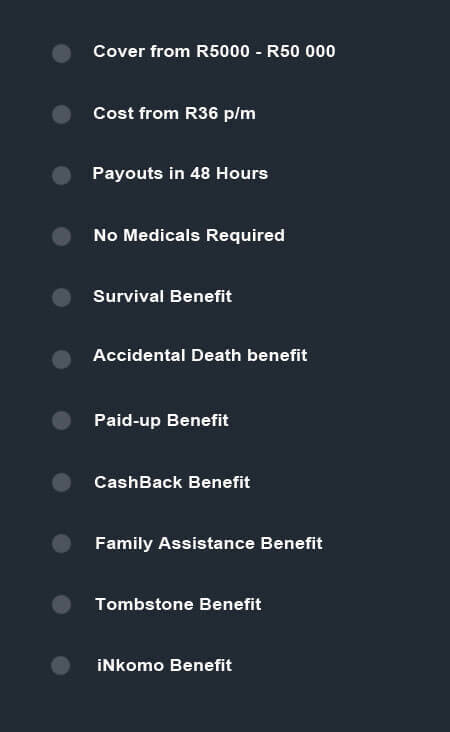 If you get extra benefits, you should consider this when you look at the payout value. Some providers will arrange the burial and pay cash. Lastly, how trust worthy is the provider? Luckily, we have gone to the ends of the nation to find the only best providers. We only compare funeral plans from top providers. We make sure they have proven themselves. We have a great relationship with all the providers we represent. We have full faith that you will get an amazing funeral plan regardless of the provider you choose. Click on the provider below the get a quick synopsis of the provider. For more information and benefits on each provider, feel free to click on “Read More”. 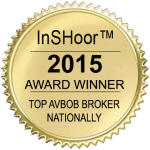 AVBOB offers one of the most inclusive funeral plans on the market. They have been around for almost 100 years. One of the biggest benefits of an AVBOB funeral plan is that you get both a cash payout, and burial services. They offer most products and services you need in-house. They have more than 200 branches across South Africa. There is always an AVBOB branch near you. This is very helpful in a time of need. You do not require any medical checks to join a policy. They give their clients the benefit of the doubt. There is a standard 6 month waiting period for natural causes. They cover accidental death from the first premium. In fact, your insured amount will double in the event of accidental death. If you are insured for R50 000 and you die because of an accident, the payout will be R100 000. 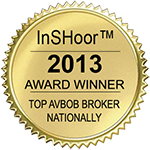 AVBOB settles claims within 48 hours if they receive all the necessary documents. They understand that you and your family need money as fast as possible. 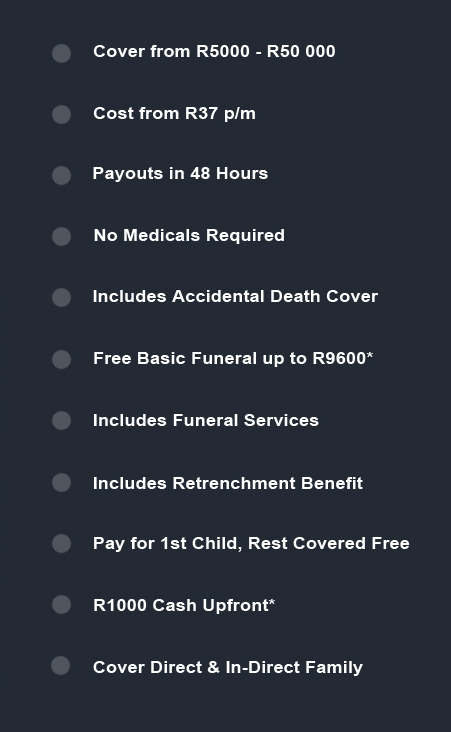 Over and above your cash payout, policy holder can get a free basic funeral up to R9600. They offer clients cashback every 5 years of consecutive premiums. This is just one more way they want to thank you for your loyalty. You can cover your direct and extended family. With AVBOB, you can cover up to 6 extended family members. You pay for just your first child; the rest will receive cover free of charge. They offer cover from R5000 to R50 000 and it starts from just R37 per month. We firmly believe that their funeral plan is among the best available in South Africa. They have a lot of experience and will make sure you, or your family receives quality treatment. They are a one stop solution and will make your memorial one to remember. When you claim, you do not have to try and figure out what to do next. They will take you by the hand and lead you through the process. Compare funeral plans & get cover today. Just click on the button below to get started. Metropolitan was founded in 1890 in Cape Town. They have since become one of the biggest names in the insurance industry. Everybody knows the name Metropolitan. This does not surprise us at all. There is a very good reason for this. They offer fantastic products with great service. They are not limited not funeral insurance products. They offer clients a wide range of insurance products. The Metropolitan funeral plan is a cash only product. What we mean by this is when you claim, you get cash to arrange the funeral. This does not mean they do not offer a wide range of added benefits. It simply means they do not arrange the burial on your behalf. One of the advantages of their cash only policy is you have the freedom of choice. You can shop around for the best possible deals. Not everybody knows how many things you need to arrange when you plan a burial. If you shop around, you can get the best prices for each service. Any money that remains will belong to the beneficiary. They settle claims within 48 hours if you provide all required documents. This policy comes with many optional and automatic added benefits. You can tailor make the policy to fit your exact needs. You do not have to undergo any medical checks to join. You can cover your direct and extended family members. With Metropolitan, you can get cover from R5000 to R50 000 from just R36 per month. Some of the value added benefits include the tombstone, paid up, shopping and other great benefits. Metropolitan has been around the block a couple of times. Knowing this, you can rest assured when it comes time to claim. The last thing anybody wants is to struggle at claim stages. They have proven themselves repeatedly. You will be in amazing hands. Compare funeral plans & get cover today. Just click on the button below to get started. Discovery has been making innovative products for more than two decades. Most people know them for products that care about your well-being. They are a provider that cares about their customers. Some of their insurance products reward you for being healthy. The good news is you do not need to have any other Discovery products to qualify for their funeral plan. This is a standalone product. 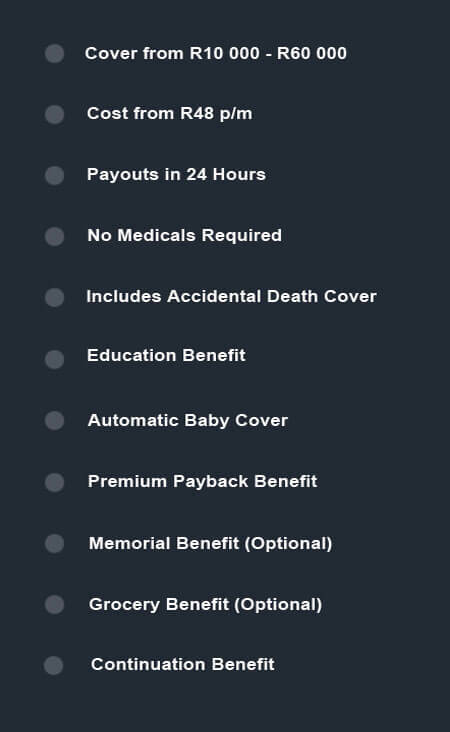 The Discovery funeral plan is a cash only product. This does not mean it does not come with great benefits. It refers to amount of support you receive once you make a claim. Discovery does not help you arrange the funeral. They give you a cash payout. This can be a great thing. You can use multiple providers to arrange the burial. You can use one provider for flowers and another for catering. You have a lot of freedom with a cash only policy. Most funeral plans are “cash only”. This is purely a matter of preference. This kind of policy is not inferior. There are no medical examinations required to join their policy. You can cover your direct and indirect family on the same policy. Discovery settles all claims within 24 hours after receiving all documents. Discovery has the highest amount of cover of any of our providers. You can get between R10 000 and R60 000 from just R48 per month. Some of the value added benefits include the Double Accidental Death Cover, Groceries Cover, Unveiling Cover, Education Benefit for Your Children, etc. They offer automatic and optional benefits. You can build you funeral plan to your ow specification. We know they have an arming product. It’s very innovative. We know you will be taken care of in a time of need. Compare funeral plans & get cover today. Just click on the button below to get started. The following is an indication of how our quotes are requested. 1000’s of people compare funeral plans every month using our service. This chart below is not updated in real time. We update it every couple of months. This is not in indication of the quality of the provider or the service they offer. The graph below should be used for interest sake only. We don’t just do 1000’s of quotes every year, we actually sign up 1000’s of happy clients. We have been awarded top AVBOB broker in South Africa since 2012. We strive to bring our clients the best possible service at zero additional cost. That’s right, our quoting service is 100% free! Compare funeral plans & sign up with zero hassle. 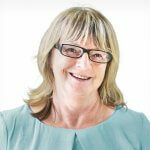 You will speak to the same consultant for any of the providers we represent. We do not send your details to multiple agents. 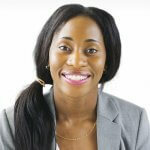 A PASSION FOR FUNERAL INSURANCE. 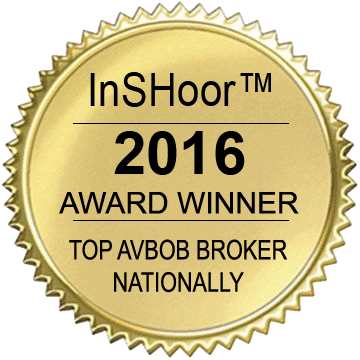 InShoor (PTY) Ltd was rewarded top AVBOB broker in South Africa every year since 2012. We firmly believe that every family in South Africa needs some form of funeral insurance. We have made it our life’s mission to make related products available to as many people as possible. Our national call center serves 1000’s of happy customers every year. We don’t just let you compare funeral plans, we help you sign up at no additional cost. A funeral plan is an insurance product that makes money available when you have to bury a loved one. You decide how much money you want to make available for each of the insured lives. Most great funeral plans come with a massive amount of benefits over and above your cash payout. Our website was designed to offer you a comparison between the top providers in South Africa. We have done all the hard work so you do not have to. Once you are satisfied with your free quote, we arrange your cover from the comfort of your own home… It does not cost you anything to use our service. That’s right, it’s 100% FREE!